Manage and protect the local religious heritage. Develop the discovery and recognition of this prestigious heritage. Support, help and develop local cultural events. Contribute to maintaining cultural and religious characteristics of our territory. Implement ways to raise money and receive subsidies to preserve the richness of our past. Pass on an intact legacy to future generations. 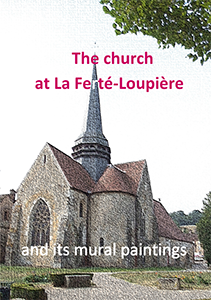 Many towns have kept the word « Ferté » in their names, given during the Middle Ages, it stands for « walled city ». As for the word « Loupière », it doesn’t seem to be linked to wolves (« Loups » in French) who used to roam this area in large numbers, but more likely to the « loupes de fer » (circles of iron), because iron was omnipresent around here and generated an important activity, since the Gauls and the Romans. The Gallo-Roman ditches remain from this time, that we can still see from the track that passes above the cemetery. The village has changed little since Mediaeval times. Protected by its outer walls, it is concentrated around a central square where the church and covered market face each other, symbolising the strong link in the Middle Ages between the spiritual and the secular. Built out of local raw materials, the buildings reflect the diversity of Burgundy materials: limestone, moulded bricks or bricks which form geometric motifs to enhance the facades, half-timbers and cob for the modest houses, ochre-tinted or red plaster, Burgundy tiles. The village is situated on the borders of Gâtinais, Champagne and Burgundy. It had the privilege of witnessing Louis VI ‘The Fat’ drink from the miraculous water of the Saint-Pantaléon spring and of welcoming Queen Alix (Adèle de Champagne, widow of Louis VII and mother of Philippe-Auguste). The early church dates from the end of the 11th century or the beginning of the 12th. We know it was in existence in 1137. The church’s portal is of pure Roman style, and so are three inner arches of the nave, on which are built the gothic structures from the 14th and late 15th centuries. We walk on three layers of paved floor: the last one is from 1856. The early church pillars are now buried underground, covered by the slow accretion of alluvium from the River Vrin over the centuries (estimated at 2 metres high over 900 years). The church was constructed for a third time and had new modifications during the 17th century, mainly under the main vault and the aisles. The capitals are decorated with geometric motifs and scrolls of vine leaves, oak leaves and water plants. A trace of the 15th Century stained glass shows the coat of arms of the Courtenay family. 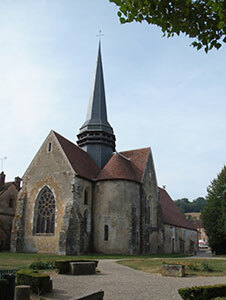 Pierre de Courtenay had to have the church rebuilt – probably because most of it was demolished during the One Hundred Years War – between 1471, the date of his marriage to Perrine de La Roche and his death in 1504. In the sanctuary, at two metres high, two grimacing heads of Roman style can be seen on the wall, supporting the beginning of a column. On the flamboyant stained glass of the apse, made in 1889, a locket showing God the Father surrounded by the twelve disciples can be seen on the centre of the rosette, and above, Jesus and Mary. The paintings are situated on the left wall of the nave, above the first three arches. 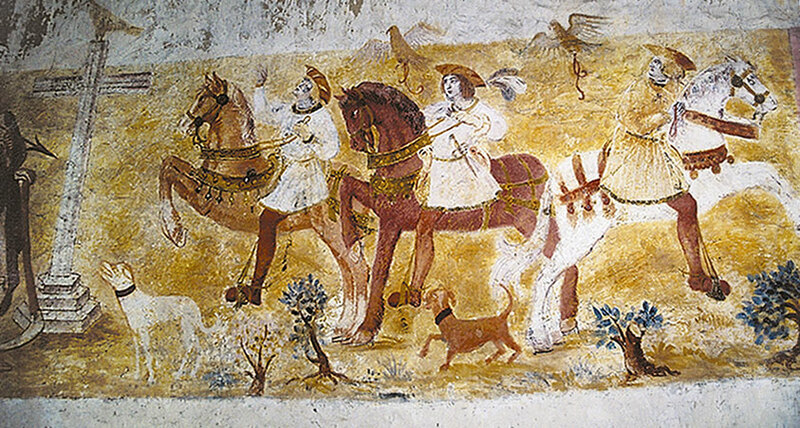 They are not technically frescoes, but wall paintings dry painted onto a lime coating. They were rediscovered in 1910, after being covered over at some point with whitewash, and were listed by the « Monuments Historiques » on the 13th of July, 1911. In 2009, they were awarded the « Grand Prix de la Fondation Prince Louis de Polignac » by the Académie des Beaux-Arts. This wide pictoral sequence gathers four subjects: the Tale of the Three Dead and the Three Living, the Dance of Death, the Slaying of the Dragon by Saint Michael and the Virgin of the Annunciation. This scene represents three young noblemen: a duke, a count and a king’s son. Whilst hunting as they pass a cemetery, they suddenly come face to face with three dead men standing outside of their tombs. They seem to be waiting for the three noblemen to draw close. 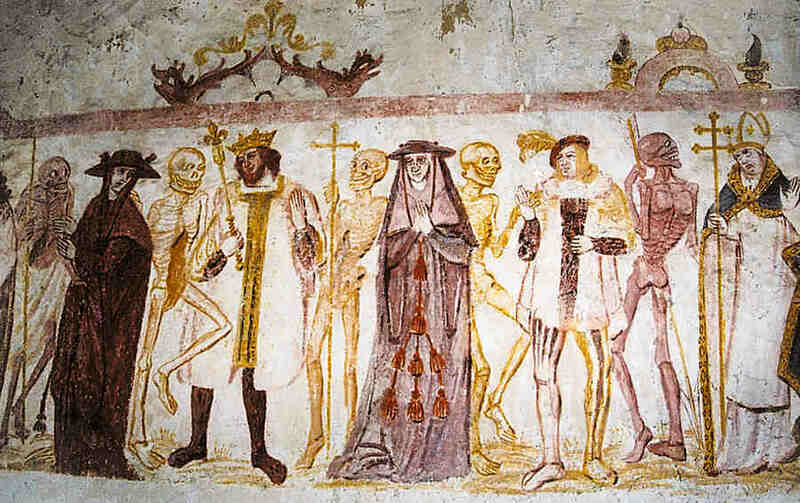 Semi-skeletal, semi-mummified, each of them is still wearing the shroud they were buried in, and one is brandishing a spear - a symbol of a rapid death – and a gravedigger’s pick. The dead warn the noblemen of their approaching end and declare: « You will become what we are. In advance, take a good look ». The three living are invited to renounce glory and wordly possessions and to lead pious lives if they are to save their souls. There are 42 personalities in the Dance of Death: the actor, 3 dead musicians and 19 couples made up respectively of one dead person and one living. The pieces of shroud, that some of the dead are still wearing, are white. The costumes of the living, very precisely drawn and of great documentary interest, are very colourful and they tell their function. The frieze framing the scene is topped with ten ornaments with various designs, inspired by the illuminations in the books. 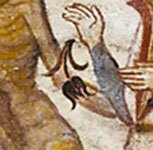 In La Ferté-Loupière, no rhyming texts exist, as can be seen in books or other wall paintings of that time. In line are: the Pope, the Emperor, the Cardinal, the King, the Papal Legate, the Duke, the Patriarch, the Archbishop, the High Constable, the Bishop, the Lover, the Lawyer, the Minstrel, the Priest, the Labourer, the Fraciscan friar, the Child, the Clerk and the Hermit. The latter salutes and brings up the rear of the procession. This painting is a reproduction of a famous painting by Raphaël. The similarity is striking. The question is whether the wall painting is a copy of the artist’s painting, or the reproduction of an Italian-style miniature which could have inspired Raphaël as well. Only a precise dating of the wall painting could tell. Raphaël completed his painting in 1518. It was soon moved to Fontainebleau and then to Paris, where it can still be seen at the Louvre. In a inspired architectural frame, with ornaments decorated with miniatures, a haloed woman is kneeling. In her left hand she holds an open book. Her right hand is raised and shows her astonishment. No doubt she is the Virgin Mary receiving the blessing of the Archangel during her prayer. The simple gesture of the hand, the serious face, the mysterious look, evoke the innocence and the intensity of the life of the virgins of Fra Angelico. From abroad, please contact us by e-mail. We keep our Church heritage alive. 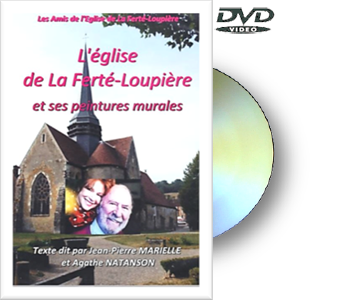 Please make cheques payable to: "Les Amis de l’Eglise de La Ferté-Loupière"